Sunday February 16th 1902 I was busy about the work all the forenoon and read in the afternoon and evening. weather still cold. Mollie came back before night. Monday February 17th 1902 Weather more pleasant today. I was busy with the work all forenoon, did ironing, and Will took me down to Fannies in the afternoon to a party. I got the supper and did the evening work. 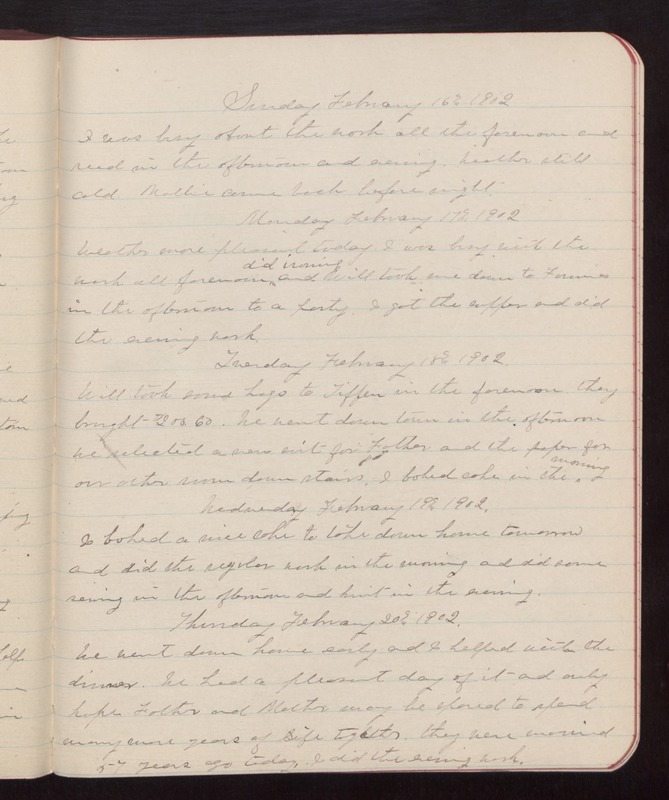 Tuesday February 18th 1902 Will took some hogs to Tiffen in the forenoon. they brought $200.60. He went down town in the afternoon we selected a mens suit for Father and the paper for out other room down stairs. I baked cake in the morning. Wednesday February 19th 1902 I baked a nice cake to take down home tomorrow and did the regular work in the morning and did some sewing in the afternoon and knit in the evening. Thursday February 20th 1902 We went down home early and I helped with the dinner. We had a pleasant day of it and only hope Father and Mother may be spared to spend many more years of life together. they were married 57 years ago today. I did the evening work.